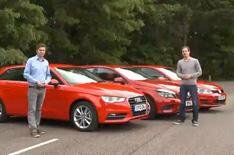 Audi A3 Sportback vs rivals video review | What Car? In our first video group test, we put our reigning Car of the Year the Audi A3 Sportback up against two of its premium rivals, the Mercedes-Benz A180 and Volkswagen Golf. These premium hatchbacks prove that buying a car you're proud to see parked on your driveway might not be as expensive as you think. All three cost less than 20,000, boast five doors and have a small turbocharged petrol engine. The Audi A3 Sportback isn't particularly cheap, but it comes with a range of efficient engines and it's great to drive. It also has a cabin that's beautifully built, with plenty of space for four. The VW Golf is refined and comfortable, but not quite as fun to drive as the Audi. However, it's easy to get comfortable behind the wheel, the cabin is practical and resale values are strong. The Mercedes-Benz A-Class is available with some strong and flexible engines, plus it looks stylish and resale values will be strong. It comes packed with lots of safety kit as standard, but the ride is too firm and the body control can't match the VW's. There are pros and cons to each car, then but you'll have to watch our video group test to find out which model takes the victory.